In football there are great seasons, and there are REALLY GREAT seasons. Too often (my brother would tell you) I reminisce about the late 70s at Vicarage Road when Watford, under the guidance of Graham Taylor, swept through two promotions and reached the semi final of the League Cup. For Watford it was the start of an incredible journey, for the club staff aspirations went sky high, and for this young boy it was the greatest introduction to football one could wish for. 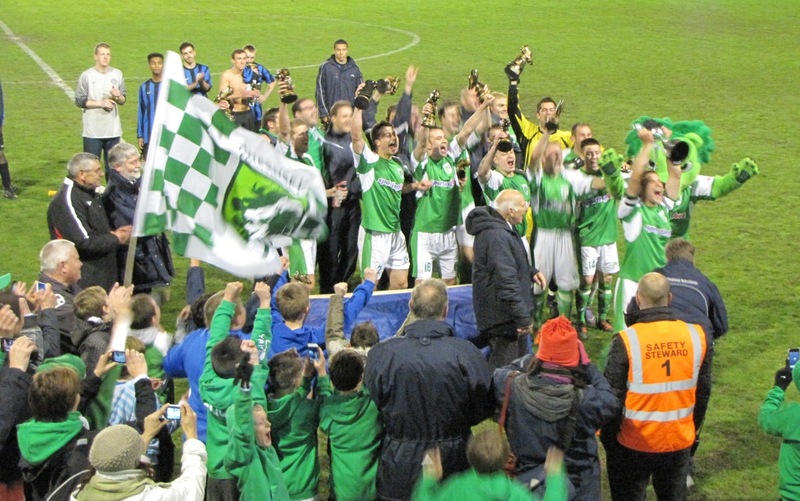 Looking around the Rushmoor Community Stadium as players and supporters danced on the pitch with The Premier Cup I knew we were witnessing the finale of another really great season; Guernsey FC’s first ever season. It had started so innocently. A small island wanting to try its hand in the big leagues, locates a stadium, secures the services of the best local management, coaches and players, dons their national green, and runs into battle in level 10 of the football pyramid. Forty-five games later, the Green Lions have probably scored more goals per game than every other side in the country. They hugely driven up attendances, and run away with the Combined Counties League Division 1, and reached the final of the Premier Cup, and most importantly won over a legion of admirers. We’ve similar stories recently of course with AFC Wimbledon, Aldershot, Chester and FC United, but as inaugural seasons go this one is totally Roy of the Rovers. The final itself pitted them against a team a division higher in Colliers Wood United. Still they’d beaten Guildford City (the Premier Division’s champions) in the semi final, and optimism amongst their affable support was running high. The more the island invasion flooded through the turnstiles the lighter the mood became. These flag waving, green-clad supporters of all ages gathered in the main stand, brandishing their league trophy, and singing rather aptly of travelling over land and seas. On the pitch, young children warmed up with the team, Roary the Lion ran the touchline, and local boy (and one time Saints penalty king) Matthew Le Tissier officially greeted the players. 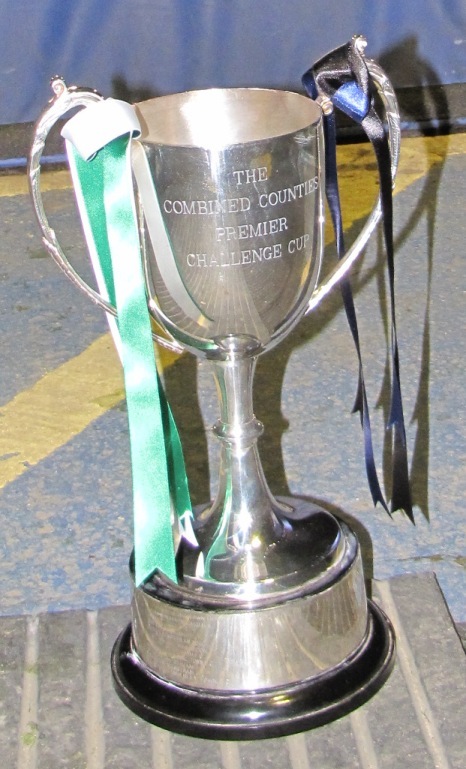 Colliers Wood is a great club but tonight, whatever the outcome, was always going to be about Guernsey. The game itself was tougher than some had expected, with an energetic contest from the start. For ninety minutes they battled it out in a wonderful spirit that was a credit to all involved in both clubs. Notable chances of the first half started with David Rihoy losing out in a one-on-one to Wood keeper Dan Burnett after being deftly put through by Dominic Heaume. Corners also came and went but United playing very deep, held firm. When they broke from their own half they relied on the speed of Harold Odametey and Mario Embalo to outwit the Green Lions. In the middle Rihoy easily found space but as soon as they advanced a blue and black wall was an immovable obstacle. Wood’s Ryan Hughes and Matt Tanton had chances too, and Jimmy Davies was tenacious in midfield. Up the other end Ryan Zico-Black was first to see a chink in United’s armour but blazed his shot over. Burnett was soon becoming the busiest keeper but most chances were missed, blocked or wasted. When he was beaten on thirty minutes, Rihoy’s shot was somehow cleared off the line. To match it Hughes had a strike parried wide by Lions’ impressive keeper Chris Tardif. There was so much to take in and seemingly precious little time to do it. On the pitch an exciting stalemate was taking shape; in the stands outnumbering Colliers Wood, Guernsey sung loud and proud. “Stand up if you love Guernsey” came the cry, quickly followed by a humorous retort of “Sit down if you hate Jersey” (I’m sure I heard another ditty about going to Holmer Green but this didn’t seem very ambitious to me). 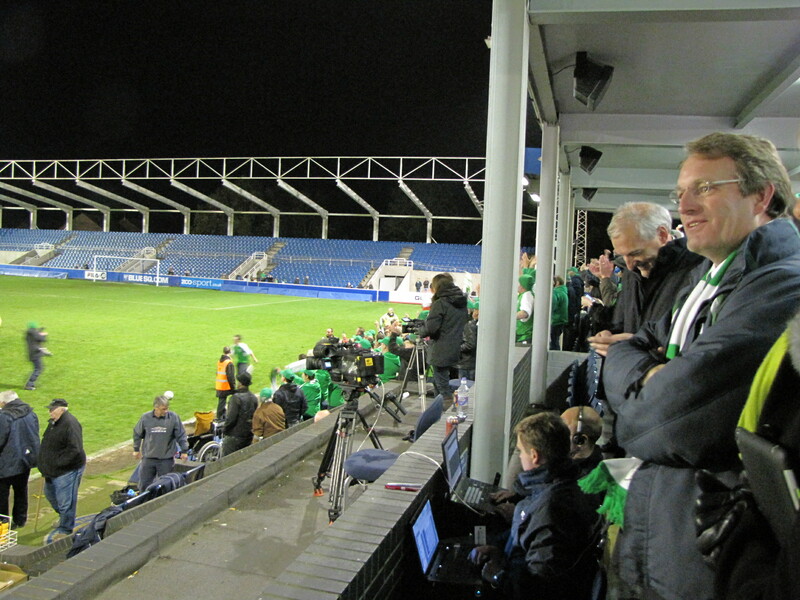 With the injury time board flashing two minutes, my companion Andy mused over the possibility of extra time and penalties, whilst Farnborough officials to the rear of the stand discussed player contracts. The final chance of the half saw Tardif saving a Davies free kick that found its way through a crowd. In all the chances had been even, and after the interval the second period continued in the same vein. Happy fans sung on, children played behind the goal, and chance, after chance, after chance was spurned. Free kicks straight at keepers, crosses parried, and defensive blocks saving the day. Considering there this was the end of a hard season for both teams, and players were suffering with cramp, and there was no goal, this was a tremendous game. When the hardest working player on the pitch, Davies, went off injured I feared for United, but still the scoreline remained. With the seconds ticking away, and in desperation, sub Tyrone Pink went down in the box but rightfully the ref waved play on; nothing so soft would be deciding this match. Shortly after the ref blew up, signalling another thirty minutes would be played. At the restart the pace was slow. The night was taking its toll on players, and I was sure penalties (maybe coached by Le Tissier) would be ours to witness. Then two minutes in Guernsey floated a corner over and finding space Heaume rose high to steer the ball home. The travelling support went wild whilst the Colliers Wood players’ visibly dropped. Wood Pink and Lions’ Cornell McKoy had the best opportunities to add to the scoreline, and Tardif made a game saving block. The rest of the half just flew by. Returning from the toilet in the turn round I saw the beautifully polished trophy resplendent in two sets of coloured ribbons. The League officials were clearly hedging their bets. When the game restarted (again) you could hardly blame them. Guernsey may have been ahead but this was an even encounter with no clear winner as yet. The last fifteen was repeatedly held up for cramp sufferers in both sides, but the large crowd were not put off, and from the sound of it officials were clearly proud of this match as an advert for their league. There were so many plus points both on and off the pitch. The crowd were tremendous, and the game was combative yet well mannered. On the Wood side Burnett, Odametey, Hughes, Davies and Embalo had all been on form. For Guernsey Tardif, Black and sub Glen Dyer stood out. And it was Jason Winch that would have the final say. A sublime pass split the United rearguard, Dyer raced clear and started to round Burnett but was brought down by the keeper. Fans beckoned the ref to show red, but thankfully he saw sense. This was not a game that deserved a sending off. Burnett had simply done what every other person in the ground would’ve done; taken one for the team. A yellow was shown and Heaume easily slotted home. 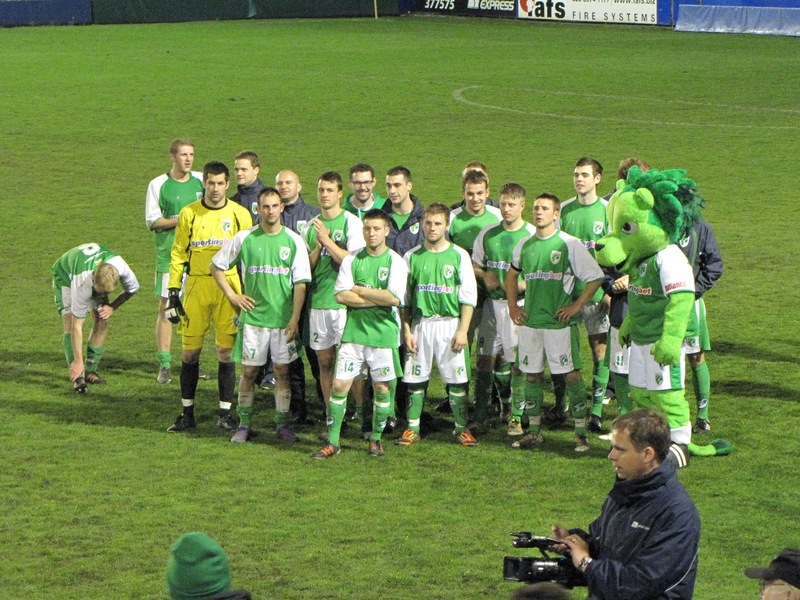 Behind the goal boys of the Guernsey Rovers AC ecstatically did the Poznań. There might still have been time on the clock but the game was truly over for Colliers Wood. After the match the presentation was everything you’d expect. The crowd stayed behind, applauded the defeated and shared the joy with their heroes. It was hard not to feel happy for them. Finding myself photographing the events from the directors’ box as the cup went up, I turned to see the elation of Chairman Steve Dewsnip. 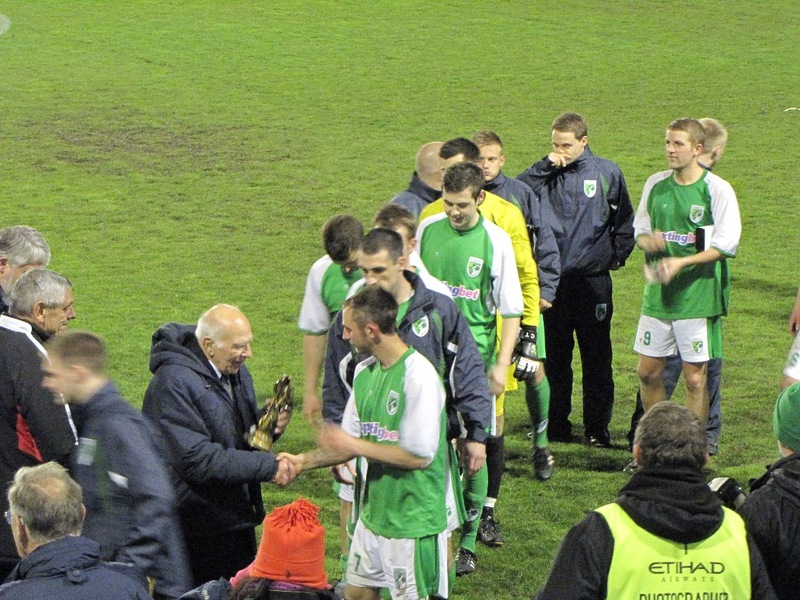 It spoke volumes; in winning the double, Guernsey has had a REALLY extraordinarily great season. Before bidding my farewells to those I’ve come to know these past months, I congratulated him on the Green Lions achievement, and then left the islanders to enjoy their moment in the sun. 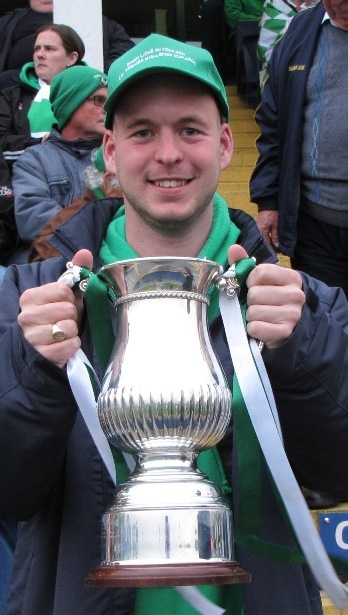 Looking back through the season I’ve seen Guernsey play, and win, four times in four different grounds (and I know we’ll meet again). I’ve travelled to Footes Lane and been openly welcomed by officials and supporters alike. The success they’ve had is extraordinary. It belongs to all of them; from Chairman to grounds men via management, players, sponsors, ball boys, supporters and the nice lady that served the Gâche. This is a community club and the community can be rightly proud of their achievements. This entry was posted in 2011-2012, Combined Counties Football League and tagged Colliers Wood United FC, Cup Final, Guernsey FC. Bookmark the permalink. Will correct the spelling. Apologies to CT.
what a night, what a season, my twelve year old daughter insists we get another season ticket for her little sister come on ccl premiership. Your article encapsulates the evening perfectly, you should have seen / heard the hotel at 1am when the team turned up, and the silence when the coach tony vance had to carry his sleeping son through the bar to put him to bed down the far corridor.